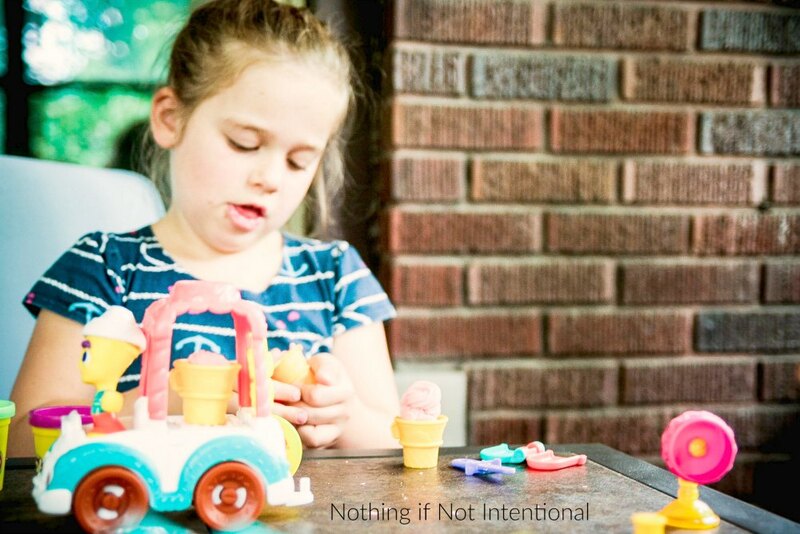 This post was sponsored by the PLAY-DOH brand from HASBRO as part of an Influencer Activation for Influence Central. I received complimentary products to facilitate my review. Visit the Hasbro website to see the fun new PLAY-DOH Town playsets! I’m a big believer in quiet time. I’m also a big believer in naps, but unfortunately my preschoolers don’t agree. Quiet time is our compromise. Even though my oldest daughter is almost six, she still has quiet time every single day. And I’m not talking about a quick, twenty-minute breather. 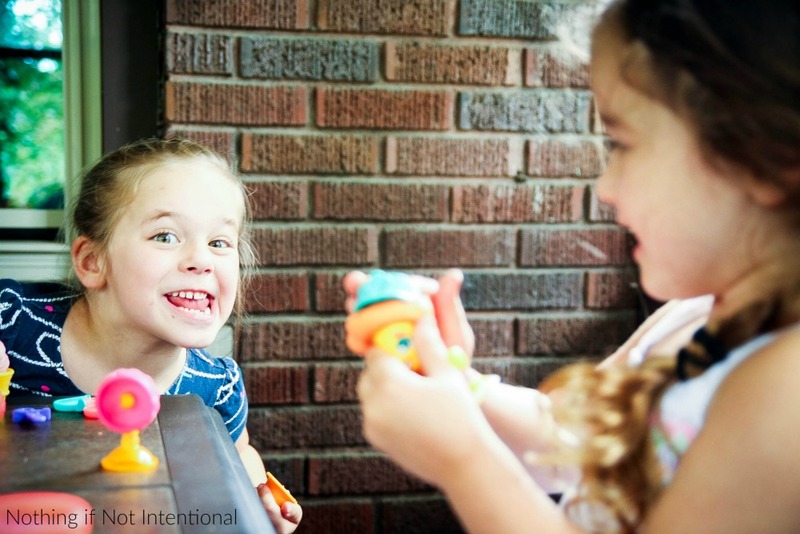 I’m a WAHM and quiet time is when I work, so I expect my girls (who are almost four and almost six) to play quietly and independently for about two hours. About a year ago, I started dreading the end of my little one's awesome, three-hour naps. But quiet time is AWESOME. Sure, it's not quite as productive or interruption-free for me, but it gives me a chance to see how creative my kid is. Today she tried on at least five different costumes before deciding to focus her attention on dressing up her stuffed animals and throw them a tea party. Two hours? They really play quietly, by themselves, for two hours? But it took work to get to this point. 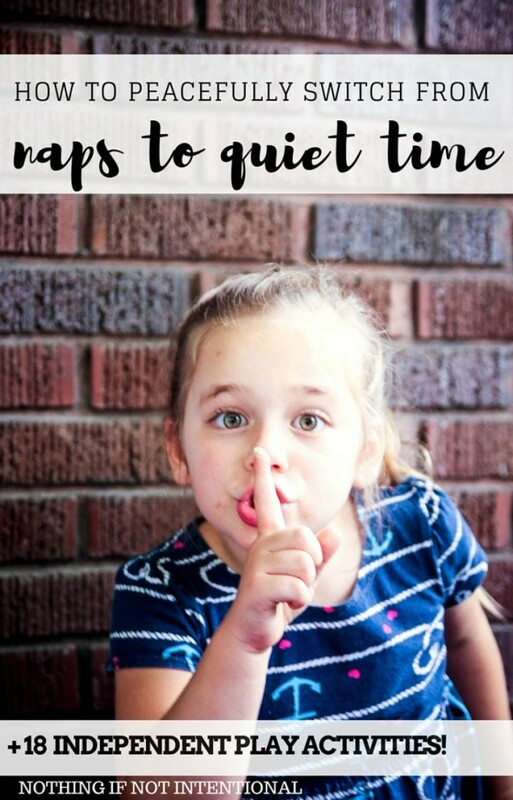 Here’s how we smoothly transitioned from naps to quiet time. Choose your side–fight naps or fight bedtime. It’s tough to know when kids should stop sleeping in the afternoon. We have a late schedule, so I didn’t mind that my kids would take long naps in the afternoon and then stay up late (very late) because they weren’t tired at bedtime. However, a late bedtime would be torture for some of my friends. They’d prefer to skip a nap and go to bed earlier. But I loved that my girls napped for two or three hours every day until they were almost four! Even now, they’re conditioned to nap, so it doesn’t surprise me if I find one or both asleep during quiet time. Prepare yourself for the witching hour. There’s a painful stage that most kids go through where they give up naps but can’t really hold it together until bedtime. 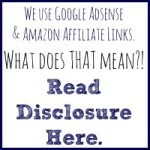 It’s a transition stage–it won’t last forever! Find the most painful time of day and let the kids play/relax in the bath, go for a drive, have a snack, play outside, watch a cartoon, do a calming sensory activity, or call in reinforcements. Help your kids to rest. When we first switched from naps to quiet time, I found it helpful to have my girls rest in their beds for about an hour and then they could spend the rest of quiet time playing. They needed to really rest, not just play. If it helps, set a timer. Have a snack plan. With our late schedule, our girls need a snack to hold them over between lunch and bedtime. I learned this the hard way. When we started doing quiet time, my oldest daughter got into the habit of sneaking into the kitchen and eating sugar! No, not “sugary foods.” Straight up SUGAR. After a little investigative work, I figured out she was hungry. So now we discuss snack options before quiet time. They are always welcome to eat fruit, vegetables, or their unfinished lunch. Sometimes I’ll add in other options like yogurt, snack bars, pretzels, or popcorn. Separate the kids. Our girls share one room at night, but they’re separated during quiet time. They fight over choose between the kids’ bedrooms, mom and dad’s bed, the couch, or the art table in the dining room. Now that they’re older, I do let them play together quietly. If it’s not quiet they are immediately separated for the rest of quiet time. And (heaven forbid) if they are loud enough to wake the foster baby, the consequences are swift and somewhat harsh. You immediately lose your most prized privilege (screen time) if you wake a baby in our house. This mama doesn’t mess around when it comes to baby naps. Make peace with mistakes. When you give your kids freedom, they may take it too far. 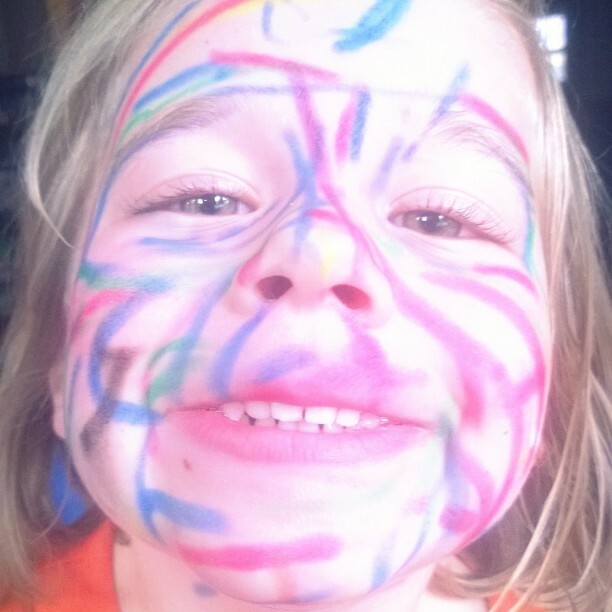 My oldest daughter went through a phase where she would go to the bathroom and color on her skin/face during quiet time. I “solved” this problem by giving her access to face paint pencils. That “solution” might still be too much freedom for you, but it worked for us. Make peace with interruptions. This is by far the hardest part of not-always-quiet time for me. When I’m working, it is so, SO hard to accept that the girls will inevitably interrupt my workflow to show me their artwork, creations, and costumes. I have to remind myself that their childhood is short, people are more important than tasks, and “freedom” doesn’t mean they don’t still need supervision and help. But again, this is definitely an area where I struggle. She was proud to show off this quiet time creation–a rolling crane with a propeller and a "funny guy that flops from side to side." I love seeing that creative, engineering mind hard at work! Set out options. 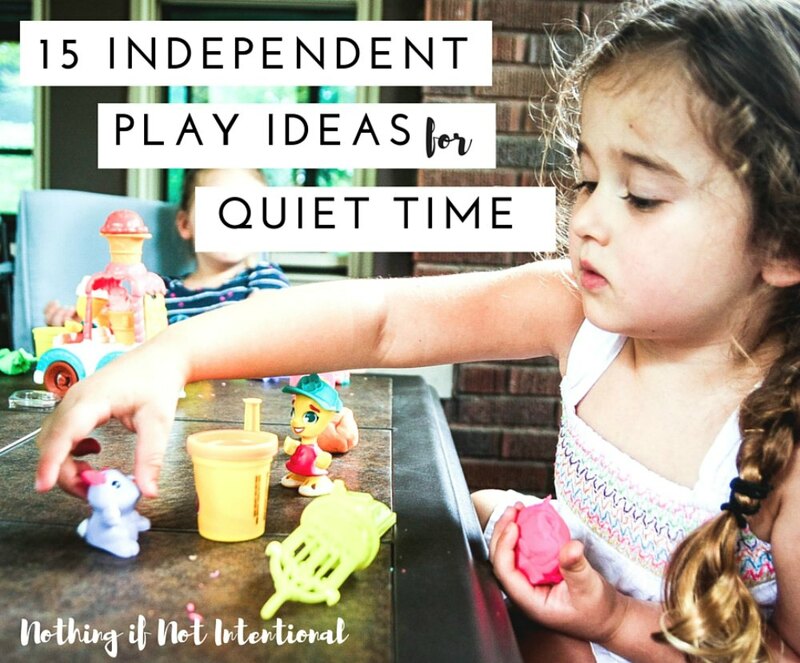 At least in the beginning, your kiddos will probably need help choosing quiet, independent play options. While my girls were learning how to do quiet time, I found it helpful to set out just a few activities each day for them to use. They were overwhelmed by all the toy/play options in their rooms, and limiting their options narrowed their focus. Need ideas? 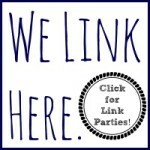 Here are our favorite quiet time activities! PLAY-DOH compound. We have multiple shelves filled with PLAY-DOH toys, because playing with PLAY-DOH modeling compound is truly one of my girls’ favorite activities. The new PLAY-DOH Town sets add even more fun for them because it encourages them to tell stories with the figures and town-themed playsets! Art supplies. Our girls are now old enough that we trust them to manage glue, paint, scissors, and even glitter during quiet time. But I strongly recommend that everything (the materials, the art space, the floors, clothes) be washable. Costumes and dress up clothes. Blankets and pillows for fort building. Marble Runs. (Even though my girls are old enough to not mouth a marble, I still prefer that they play with marbles in the same room as me. I can’t have any lost marbles with a baby in the house. Audio books. This has been the key to mastering quiet time with my older daughter. We started with a c.d. player and read-along picture books. Eventually we moved the audio books to digital devices. Now our oldest daughter listens to at least one chapter book at day during quiet time. PLAY-DOH modeling compound has been a childhood staple since 1956! And for good reason. This type of play captivates kids and strengthens their fine motor muscles. 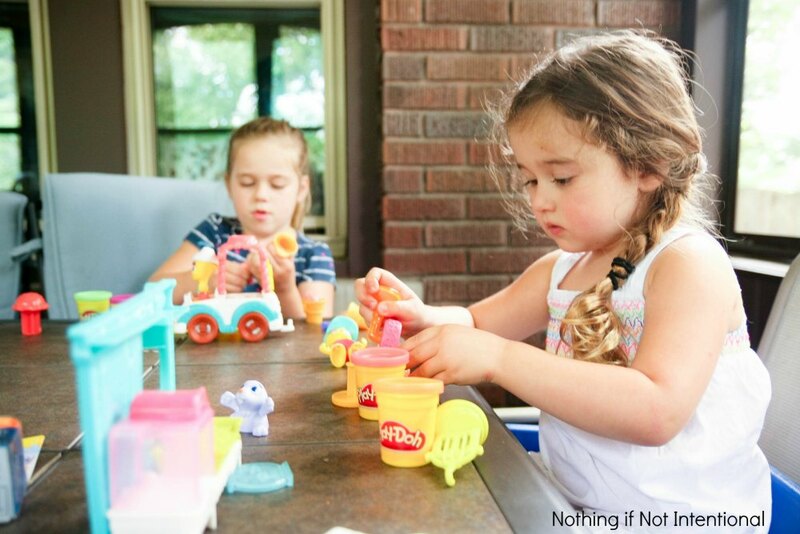 The new PLAY-DOH Town play sets encourage kids to play creatively and inspire creative storytelling through the use of figures, characters, and town-themed Playsets and vehicles. Be sure to pull out the PLAY-DOH cans on World PLAY-DOH Day on September 16! Find your child’s favorite from the options below! Kids can use the fire stamper to create crazy fire scenes, before filling up the water cannon and hydrant to save the day with PLAY-DOH water spray! Little one FIREHOUSE set includes playset, firefighter, firedog, accessories, and four cans of PLAY-DOH compound. DOH ICE CREAM TRUCK playset! Help this animal-loving storeowner get ready for work by creating fun PLAY-DOH hairstyles, outfit accessories, and adorable little bunny slippers, then help her fill the shop with cute and colorful animal creatures! This assortment includes police and ice-cream themed figures. Additional figures for painter, doctor, ballerina and fisherman will join the line in the fall. ← 8 Tips for Taking a Disney Family Trip with Grandparents!